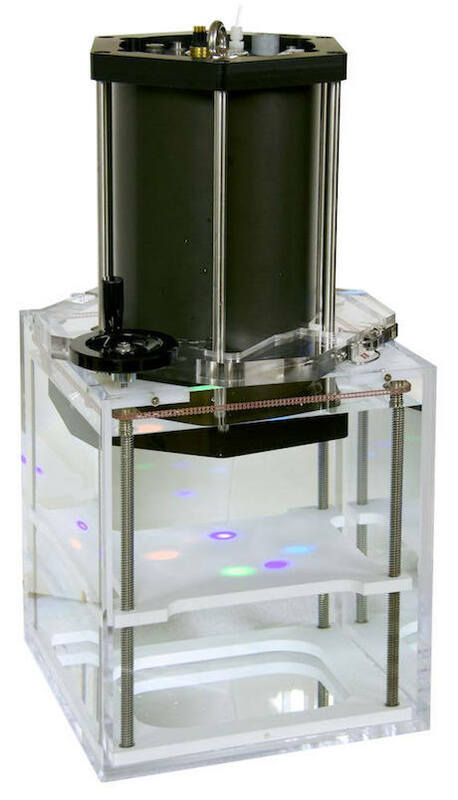 The unique design of HydroScat backscattering instruments supports calibration in a simple apparatus that can be operated by users. Hobi Instrument Services offers this apparatus for sale. The apparatus allows the operator to precisely vary the distance from the instrument face to a Spectralon™ plaque with 99% reflectance. The signal as a function of distance provides all the information needed to calculate coefficients for converting raw data from the HydroScat to backscattering in units of m-1sr-1. Fill the tank with filtered water. Place the wetted reflectance plaque on the platform. Rest the instrument atop the apparatus, with its face a few cm under the surface (not touching the plaque). Connect to the instrument with HydroSoft software, and follow its instructions. For more details, see the Calibration Manual. Each instrument requires an appropriately-sized collar to support it during calibration. Specify the instrument model(s) you wish to calibrate: HydroScat-6, HydroScat-4, HydroScat-2, or HydroScat-2 Abyss. The required Spectralon™ plaque may be purchased from Hobi Instrument Services, or directly from Labsphere, Inc., model number SRT-99-100.